When deploying and managing multiple kiosks, especially kiosks over a broad range of geographic locations, remote kiosk management is an essential tool for maximizing your resources. Some features of kiosk management software include usage statistics, remote monitoring of kiosk health, managing kiosk content, and kiosk grouping. KioWare makes reporting easy. Share your kiosk data using KioWare’s standard reports or create custom reports with only the data you want to share. For instance, reports can be shared with the relevant departments to improve user conversions by analyzing user paths (the most common paths being taken by users. Given the importance of kiosk availability, remote monitoring via KioWare Server or KioCloud can be an essential tool for ensuring kiosk uptime. KioWare Kiosk Management tools send an email notification when kiosks miss heartbeats or experience a status change (depending on your settings and the severity of the event), allowing you to quickly ascertain the device’s issue. You can view the health (via kiosk heartbeats) of all of your kiosks via a status overview page, enabling you to have a bird’s eye view of all of your kiosks with one dashboard. This provides peace of mind with one quick glance and allows you to minimize downtime and efficiently tend to temporary kiosk health issues without an on-site visit. Group management of kiosks allows you to manage kiosk settings, stats, and content by categories/groups of your creation. You can group the kiosks by region, performance, or other segmenting that you determine necessary. This allows you to customize content and settings to optimize conversions and satisfaction amongst users. Content Traversal - Used to analyze the most common paths taken by the user, e.g., what was the most common second page viewed? 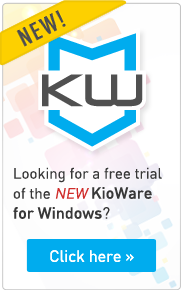 • KioWare Server is available for hosting on your own server and KioCloud is a KioWare hosted subscription solution. Managing your kiosks with KioWare's Kiosk Management solutions can increase efficiency, minimize downtime, and improve customer experience, all while increasing the amount of data available to make informed decisions about kiosk content, usage, and placement.